Going to McDonald’s isn’t usually a fancy experience. We all know what the typical Mickey D’s experience is like. What a lot of people don’t know is that there are some very fancy McDonald’s locations out there, in a host of different countries. 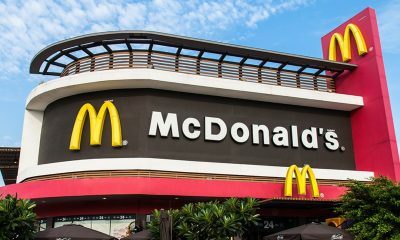 If you’re a fan of this fast food chain’s juicy burgers, golden French fries, apple pies and ice-cold sodas, you may want to make visiting the world’s fanciest McDonald’s restaurants a priority. When you do, you’ll be able to soak up a whole different ambiance. From McDonald’s in mansions to UFO-shaped eateries and beyond, the fanciest McDonald’s are really something special. If you want to nosh on typical McDonald’s fare in a swanky atmosphere, sure to head for New Hyde Park, New York, USA. You’ll find a McDonald’s which is a lot fancier than most. 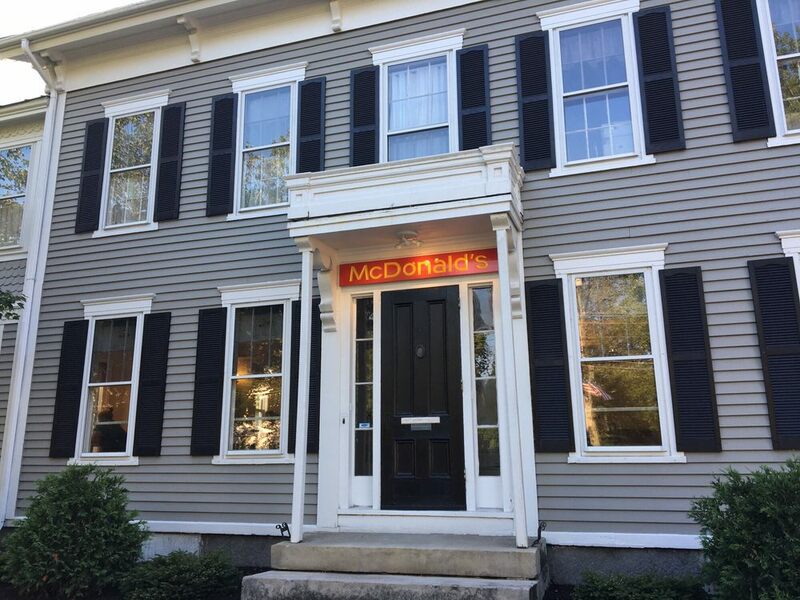 This elegant Mickey D’s location will be a great place to hang out, because you’ll be able to eat in a Georgian mansion that was constructed way back in 1795. Known as one of America’s most beautiful Mickey D’s, this location is extra-special, in part, thanks to its colorful history. The mansion was bought by McDonald’s execs, who initially planned to do a tear-down and then changed their minds. Execs changed their minds because some conservation-minded residents of New Hyde Park had the mansion declared a local landmark before it could be destroyed. Since McDonald’s executives weren’t able to tear it down as they had hoped to, they decided to offer fast food right in the mansion. When you visit this location, you’ll be able to enjoy your meal while relaxing on a veranda that’s enclosed by glass. You’ll also love the location’s sweeping staircase. It’s nice that this grand house was saved. It does have a lot of character. It’s a beautiful place to enjoy fast food fare while in New York. Tokyo is a city that’s always on the cutting edge. It’s a city where people are always looking for the latest novelty. 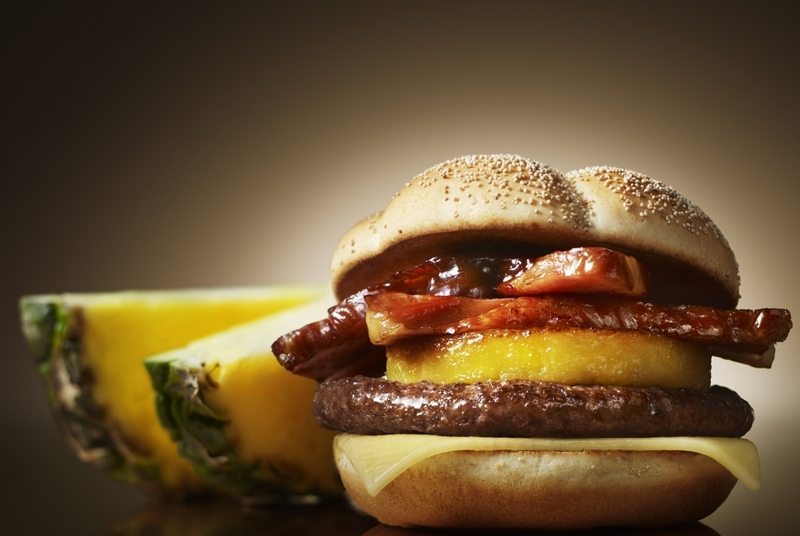 Back in 2008, McDonald’s decided to debut the tasty Quarter Pounder in Japan. 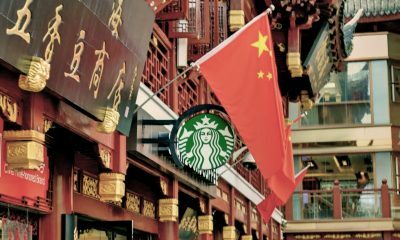 The company did so by setting up a retail outlet or two in Tokyo, which didn’t feature any of the typical McDonald’s logos and names. The shops had signs that said, “Quarter Pounder”, as well as sleek and sophisticated design. In terms of design, these fast food restaurants had black-and-red decor that was a step up from the chain’s typical fast food joints. These eateries featured sofas from Le Corbusier and stripped-down menus. Customers had a choice of just a couple of Quarter Pounder meals. One burger had cheese and one didn’t. Food was served in black and red packaging for an ultra-modern, fancy look. The shops popped up in fashionable areas of Tokyo, but weren’t destined to last. 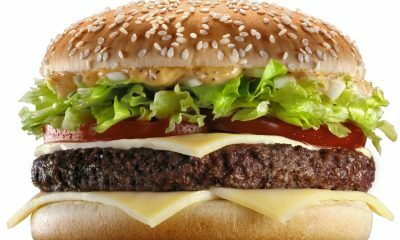 Later on, the Quarter Pounder with Cheese was eliminated from McDonald’s menus in Japan. Apparently, Japanese consumers don’t appreciate the many virtues of the hearty Quarter Pounder with Cheese. 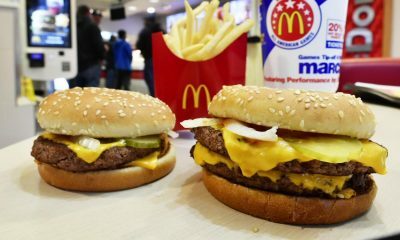 When this particular burger was removed from the menu in April of 2017, some Japanese Quarter Pounder fans did complain via social media, but Quarter Pounders are still off the menu. In 2015, McDonald’s Japan went fancy again, by offering access to “Restaurant M”, which was a one-day pop-up shop in Tokyo. It was designed to showcase Fresh Mac LTO menu items. The eatery featured white tablecloths and enough seating space for twenty guests. Patrons who enjoyed the “Restaurant M” experience were served five-course meals which included ‘Vichyssoise Mac” french fries, plus salads in gelatin. McFlurries were offered for dessert, in elegant bowls. In the 1960s, a building was constructed in the heart of Rotterdam which was commonly perceived as an architectural nightmare. Some believed it was Rotterdam’s ugliest building. Decades later, McDonald’s powers-that-be decided to turn an eyesore into a cool, innovative and high-end McDonald’s restaurant. 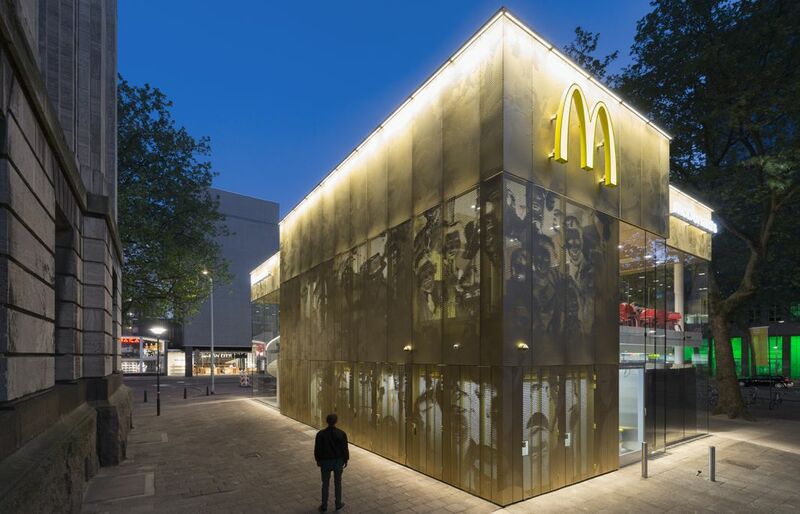 McDonald’s Rotterdam execs teamed up with the Mei Architects company to create a splendid new restaurant with the sleek, ultra-modern look of an Apple Store. The ugly building was transformed into a veritable showplace. It features a dramatic spiral staircase, as well as a facade in gleaming gold. The space is equipped with a lobby that’s transparent. Patrons may enter the restaurant from three sides. This location is open every day and night. It never closes. A lot of care was given in terms of making the eatery looking amazing after dark, but it looks great in broad daylight, too. If you visit, you may sit inside and enjoy the decor, as well as traditional American fast food, or lounge outside, on outdoor seating that is the same as the outdoor seating in a lot of public squares in the city. If the idea of entering a McDonald’s restaurant with a giant bronze eagle sculpture over the front door is appealing, head for Porto, Portugal. Its McDonald’s is considered to be the ultimate in terms of beauty. Porto is an ancient coastal city which is situated in the northwest part of Portugal. It’s renowned for its cobblestone streets and medieval architecture. This particular McDonald’s opened in 1995. The space it occupies was formerly occupied by Cafe Imperial, which was a well-known coffeehouse that had been around since the Thirties. The coffeehouse was considered a shining example of the Art Deco style of architecture. When they took over the space, McDonald’s execs made a point of keeping the majority of the building’s charming architectural features in place. 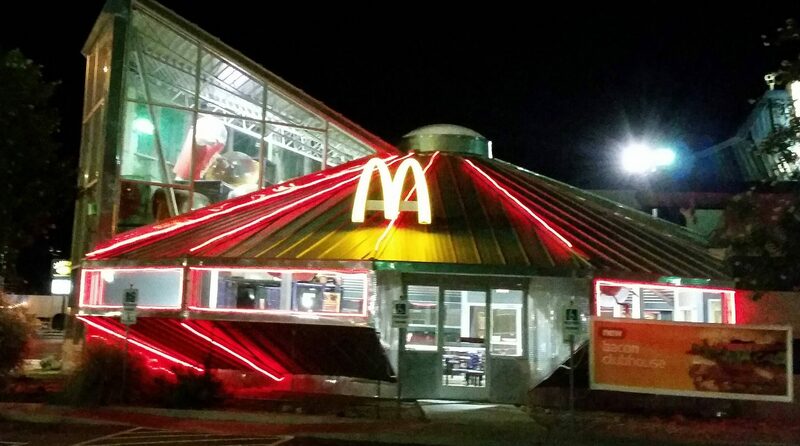 This restaurant is also referred to as the “McDonald’s Imperial”. The fast food eatery looks just as good outside as it does inside, thanks to glittering chandeliers and a huge stained glass window. If you want to chomp your burger or McChicken sandwich in high style, you can do it at this Portuguese McDonald’s. It’s an architectural marvel that attracts plenty of locals and tourists. You’ll feel like royalty as you enjoy classic Mickey D’s fare in this highfalutin setting. Nestled inside of the bustling Admiralty Station in Hong Kong, this fancy restaurant is all about reinvention. 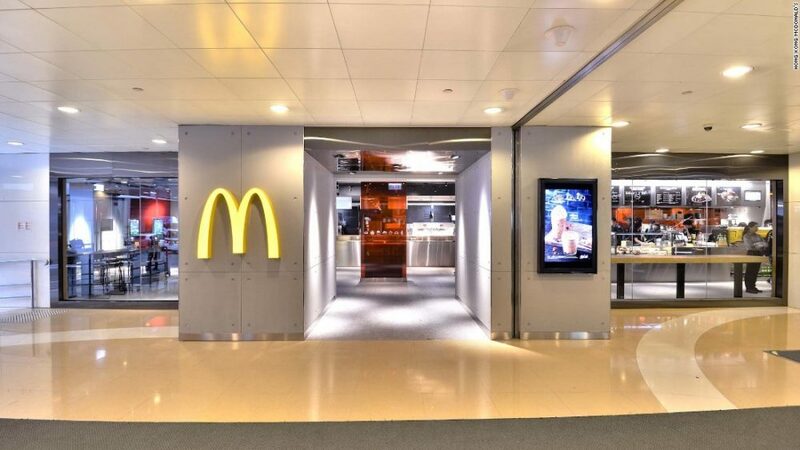 McDonald’s NEXT provides a calm and serene dining experience to locals and tourists. A brand consultancy and retail design firm from Australia took on the challenge of transforming a typical fast food joint into something more chic. This Hong Kong eatery doesn’t have the usual bright colors and bright fluorescent lighting. It’s got a sleek silver-tone look that is muted and sophisticated. The overall effect of this elegant and fancy McDonald’s is understated, with a little industrial edge. Some duct work is visible, oak wood is untreated and walls have visible join-works and studs. It has a bit of a warehouse vibe, along with fashionable elements that enhance beauty and comfort. Also, the lighting shifts from day to night, to create an inviting ambiance. 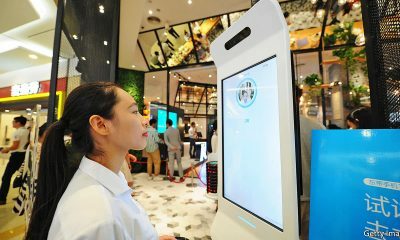 Customers may order at computerized kiosks, and then enjoy ultra-modern seating options that are perfect for a wide array of customers, from solo diners to couples to groups. Do you want to eat in a Mickey D’s that looks like a costly Manhattan condo? If so, you’ll probably adore this high-end McDonald’s. It’s got some features that are very hard to find at other McDonald’s locations. Freeport is a compact seaside town in the state of Maine, USA. Freeport is known as the home of L.L. Bean. This fancy Freeport McDonald’s is located close to L.L. Bean HQ, along with high-end shops, including Burberry and Polo Ralph Lauren. This particular Mickey D’s is special because it’s the only McDonald’s in Freeport. It’s also special because burgers and fries are served inside of a historic home, known as Gore House, which McDonald’s renovated to suit its needs. This mansion was constructed in 1850, for a successful local merchant named William Gore. Since the seaside town has pretty stringent building design regulations, the team at McDonald’s decided to open a location in a residential zone. When people in Freeport found out about McDonald’s plans, some residents of Freeport loved the concept and some just didn’t. Opinions were all over the place. Construction was permitted, provided McDonald’s stuck with the aesthetic of the town. The restaurant has the usual McDonald’s look on the inside, with the traditional New England look on the outside. There’s a drive-thru, too. If you admire quaint architecture that hearkens back to days gone by, and also love fast food, you’ll enjoy eating at this McDonald’s location. You won’t find any golden arches here. It’s not that kind of McDonald’s! 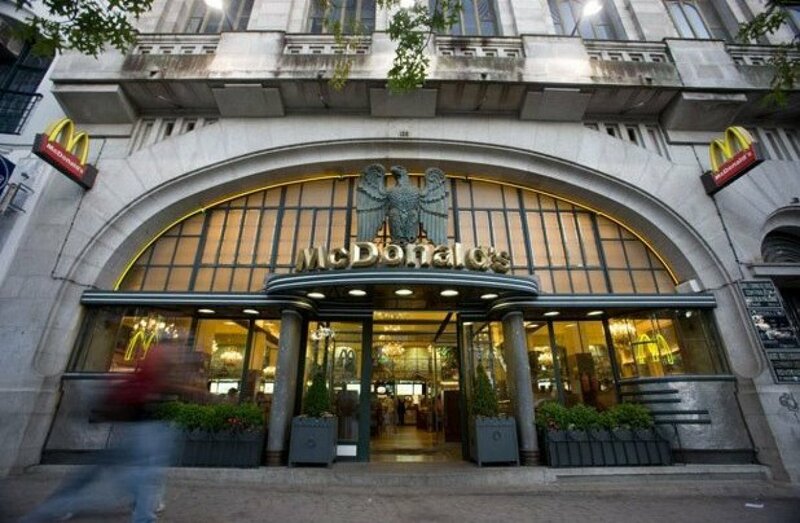 If you want a fancier McDonald’s experience, you may want to order your fave Mickey D menu items at this stunning McDonald’s in Madrid, Spain. It’s got a luxurious vibe that is ultra-appealing …and way different from the norm. When you visit this palatial Mickey D’s, you’ll be able to enjoy one exciting, exclusive and unique menu item. This specific McDonald’s offers cappuccinos dusted with chocolate and you won’t be able to find these designer coffee drinks at other locations. While McDonald’s is offering more coffee drink choices these days, such as Caramel Iced Coffees, the cappuccinos at the fancy Madrid location aren’t on the menu at other McDonald’s restaurants. Clustered near other buildings which also have have palace vibes, this decidedly fancy Mickey D’s has a coffeehouse feel, but does offer the usual burgers and fries. 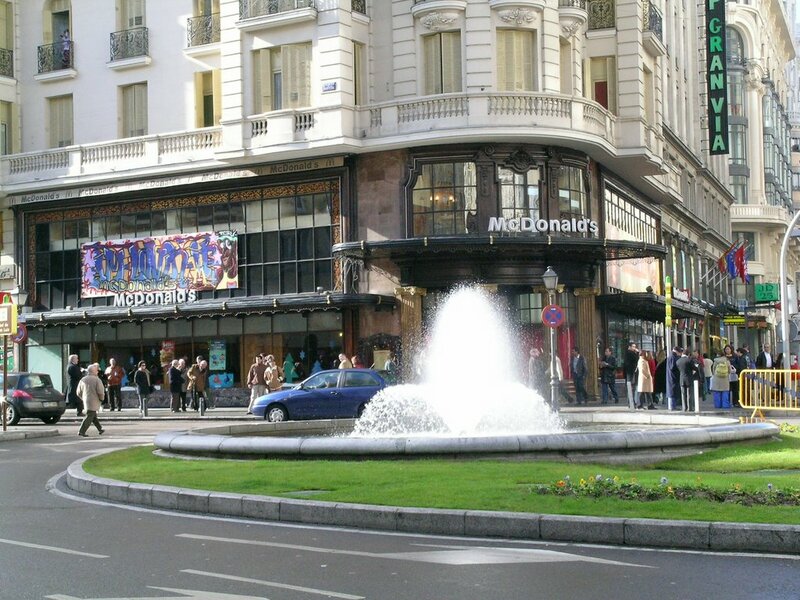 Tourists who travel to Madrid and seek out familiar fast food at McDonald’s will enjoy getting the burgers and fries – and cappuccinos – that they crave, while also marveling at the eatery’s architectural details. If you’re one of those people who Instagrams your lunch, this place may really inspire you. It’ll provide some amazing backgrounds. 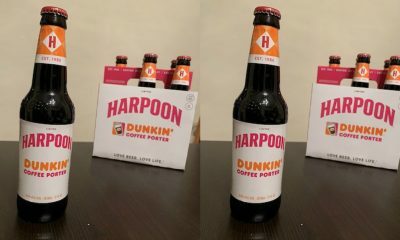 Ok, this one is really fun. It’s fancy in a way that’s whimsical. This McDonald’s looks like a huge Happy Meal and this entertains me. I would enjoy eating here. While it doesn’t have the look of a New England mansion or a European palace, it is special and fancy in its own way. It’s not supposed to be sophisticated or have heritage credibility. 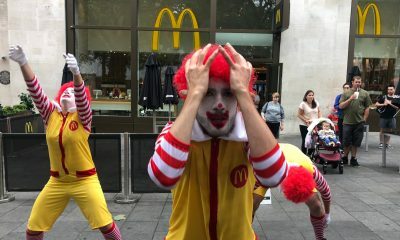 It’s supposed to embody the playful spirit of the Happy Meal and McDonald’s famous cartoon characters, including big and purple Grimace and mildly creepy Ronald McDonald. Most McDonald’s don’t have this type of playful architectural design. People who have visited this Dallas location are blown away by the building. They love its Happy Meal Shape, as well as its cool drive-thru, which has the feel of a ride at Disneyland, thanks to airport runway-style ground lights, as well as an overhead planetarium. You’ll find the usual McDonald’s grub here. What’s special is the atmosphere. It makes going to this Mickey D’s feel like an event. At this location, the exterior is fabulous and the interior is pretty special, too, with lots of shiny red design elements. 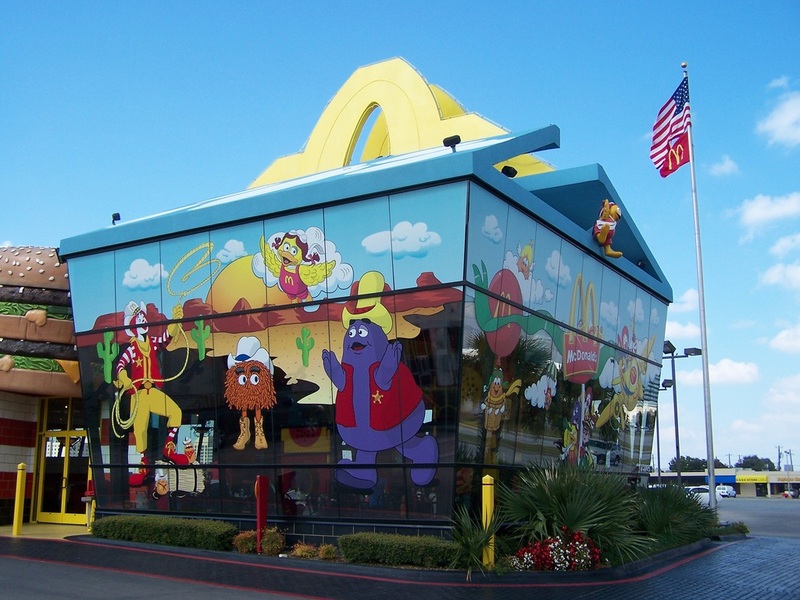 Ideal for kids and kids of all ages, this wild McDonald’s has a Las Vegas or Disney vibe, even though it’s situated in Dallas, Texas. This McDonald’s has an epic PlayPlace. Local residents who are parents of little kids must love bringing them here for their birthday parties. Kids definitely love this unique Mickey D’s. Roswell is steeped in Area 51 lore and one notable Roswell-area McDonald’s captures the Roswell spirit and spookiness, thanks to its UFO shape. If you’re into flying saucers and the whole Area 51 thing, this fancy Mickey D’s may just be the McDonald’s of your dreams. During the daytime, you’ll love the “UFO’s” sleek silver shape. At night, you’ll appreciate the neon piping that illuminates its unique dimensions. A building close by features a big mural of beloved McDonald’s cartoon characters, who are flying spaceships around a brain the size of a planet. McDonald’s arranged for this mural to be painted. The mural is a bit of a distraction while people are going through the drive-through. Lots of people enjoy fast food at this location and just as many enjoy photo ops while they are there. While this fancy McDonald’s isn’t about elegance, it is definitely impressive. It’s meant to capture the spirit of the region and spark the imaginations of visitors. It’s pretty cool just how much effort has gone into the design of these fancy McDonald’s. McDonald’s clearly wants its customers to enjoy first-rate experiences at their eateries. While every McDonald’s can’t be an architectural marvel, there are plenty of truly fablulous McDonald’s locations out there. 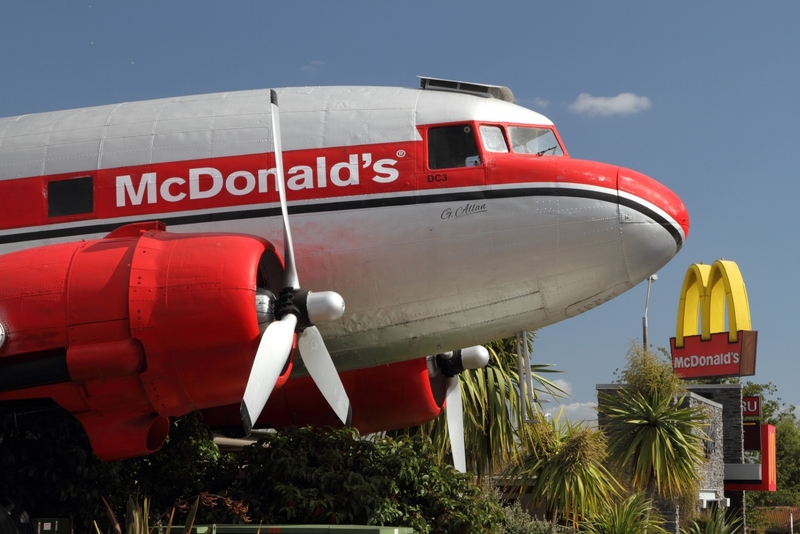 Would you enjoy eating fast food from McDonald’s inside of a decommissioned plane? If so, head for Taupo, New Zealand and then live the dream. Chill out and relax onboard, knowing that you won’t be subject to flight delays or typical airplane food. It’ll also be nice to get off the plane whenever you feel like it, rather than being stuck in your seat for hours. This fantasy-style McDonald’s is definitely a fancy choice and it’s perfect for aviation buffs. The plane is a DC-3 twin-propeller jet. It’s a vintage airplane with so much style and retro appeal. This very special McDonald’s seats just twenty guests. The plane is mounted atop a typical McDonald’s restaurant, and it’s a lure that draws in so many curious tourists. Now that you know 10 of the fanciest McDonald’s on the planet, you’ll be ready to visit them while you travel. While you might not want to do a fancy McDonald’s tour, like some people do roller coaster tours, you may want to hit at least one on the list. 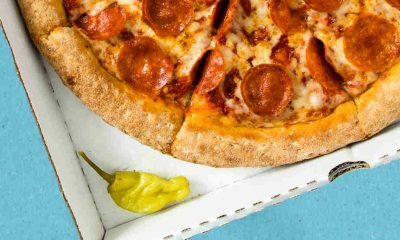 These fast food joints are off the beaten track. They offer experiences that are unusual and interesting, whether they’re elegant or very playful. McDonald’s has its fans and detractors. Health nuts probably won’t care if there are fancy McDonald’s, while those who are into occasional fast food indulgences will love these high-end McDonald’s locations. 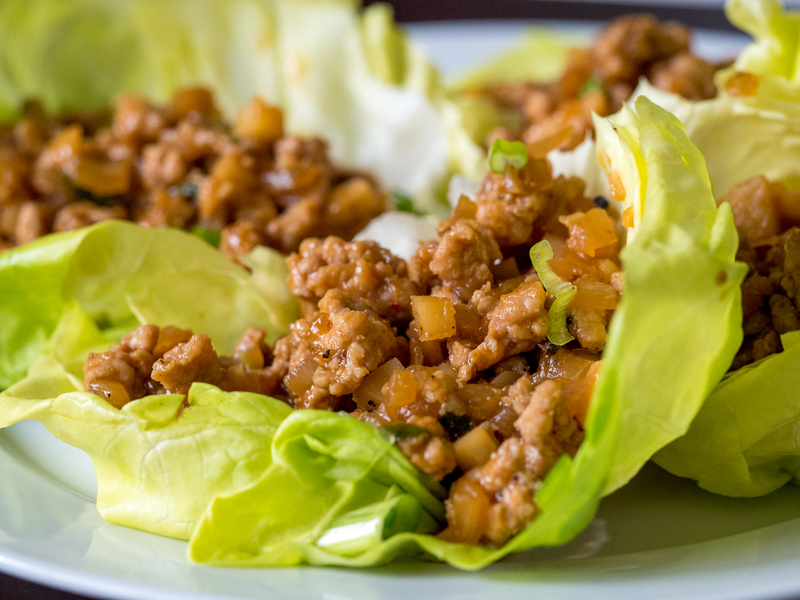 While every fast food location is trying to offer healthier options these days, it’s still fast food and a lot of people love the basic stuff, like burgers and fries. They aren’t looking for kale salads or anything like that. At fancy McDonald’s, they can eat in style.